Shelley and Christian dig deep into friend of the show Meredith Ochs' latest book, Aretha: The Queen of Soul - A Life in Photographs. Since the book is filled with photos, along with three essays by Ms. Ochs, we decide to play as many disparate songs by the Diva of divas to showcase just how amazing Aretha really was during her lifetime. Aretha Franklin’s voice was legendary, unforgettable: deeply rooted in gospel, yet versatile enough to brilliantly interpret R&B, rock, soul, pop, and jazz standards, it fueled a six-decade career. Her vocal wallop was a mix of preaching, rebuke, and elation. From the languorous “I Never Loved a Man (the Way That I Love You),” to the funky “Chain of Fools,” to the fiercely feminist “Think,” to the definitive, demanding version of Otis Redding’s “Respect,” Franklin’s songs played out against the tumultuous sociopolitical backdrop of the late ’60s like a soundtrack meant to set things right. Her accolades were many: she received the Kennedy Center honor in 1994, won 18 Grammys, was the first woman inducted into the Rock and Roll Hall of Fame, and performed for presidents and the Pope. 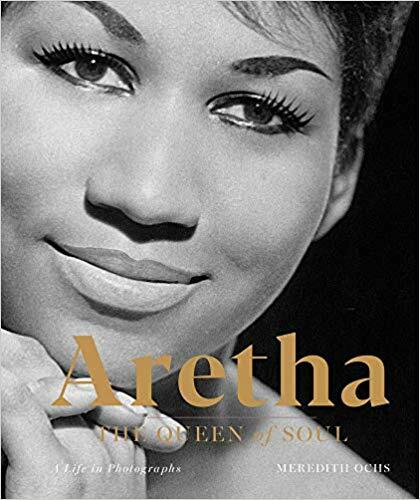 Illustrated with 85 photos, and with insightful text from noted radio personality and author Meredith Ochs, Aretha explores the diva’s life, from her formative years growing up in Detroit, to her singing and recording career from the 1950s until her untimely death in 2018, to her numerous honors, awards, and causes, including her advocacy for civil rights and the arts.